Little minds (mine) are hopelessly entertained by the concept of Rhinebeck knitting. No, not the FO type. I'm speaking of the WIP species needed for the weekend's festivities. 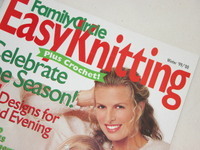 The well-known criteria include mindless pattern, easy project, just-make-the-stitches while communing with Our People. Many, maybe even most, choose socks. The pattern is easy. I planned on my tried and true stockinette stitch sock. But isn't there a subtext here of cool yarn? Indie dyers? Hard-to-find-sold-out-instantly yarn? Those casually knitting with Wollmeise this weekend probably win this knitters' unspoken challenge. I rip through my not-insubstantial stash. Indecision prickles my brain. I have no Wollmeise. Should I pull out the AppleLaine? The Sundara yarn? As I talk of this with the Knitigator, she suggests a scarf. I have just the yarn! I described the colors - pinks, blues, purples. "Pink??" she queries as she tilts her head. I had to laugh. "Yes. Pinks." 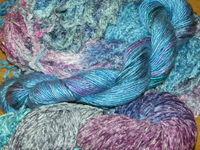 The first yarn I ever fell madly in love with was a skein of Colinette Isis in the 'Fresco' colorway. It adorned the rail of the stairs for a month as yarn-art before I would put it in the stash to marinate. It was a lonely skein. I've added two other skeins - a silk yarn, also from Colinette, in the same colorway, and a Fiesta silk chenille, perfectly matched. The first was planned, the second was pure accident. The yarns clearly call for a simple stitch, knit lengthwise. I had to figure out gauge vs. skein length so I could cast on a number of stitches that would waste the least amount of yarn, and not leave me stranded in midrow. Knitigator heard all this. She fixed her bemused green eyes on me. "This scarf needs to be knit with RECKLESS abandon! Colinette yarn? It is French! The French are not precise. This is NOT the time for math and precision ! The yarn needs to be, demands to be knit as it is. STOP. PLANNING." I will knit with reckless abandon. Although...the French only look like they're doing it with reckless abandon. Trust me, it's all planned down to the last little freaking iota. Sounds like you're all set to me!! 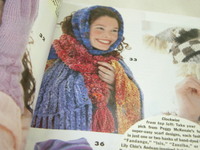 I can already see the breeze blowing through your hair as you knit this wonder. Reckless abandon. Yes, yes, Kathy is correct. I'm all about the reckless abandon. 3 cheers. I can't wait to see it. 5 sleeps. The Knitigator may be right about the reckless abandon, but Colinette? It's Welsh. Oh wow, I stand corrected. I'm still holding onto the Eiffel Tower/little chic cafe imagery for reckless abandon. That said, I'm betting that Catherine Zeta-Jones, if she's a knitter, knits with r.a. I'm seriously considering working on a garter stitch scarf from Colinette Isis (a chenille yarn made from a decidedly unnatural fiber). Okay, maybe not. I can just picture that conversation taking place! You and reckless abandon? Heeheehee. Reckless Abandon is good - can't wait to see what emerges. My Rhinebeck knitting will be a scarf too. Although not one as free-spirited as yours. I just finished my recklessly abandoned Tahki Ghost scarf and let me tell you, it was fantastic! The perfect "knitting vacation". And, as I recall, it was Kathy who talked me into that one too! Reckless abandon is highly over-rated. Ask me how I know that. Hee! Yes, heed the Knitigator. She is a wise one. I look forward to seeing what reckless abandon looks like on you. And if Colinette is, indeed, Welch, then that means you'll have to sing as you knit with reckless abandon! oh yes, I can just imagine the "you" and the "reckless abandon". I'm smiling... sounds wonderful, and freeing. Go for it! That Knitigator is a wise woman! Cracking up at "She fixed her bemused green eyes on me". I know the expression well and love it! Reckless abandon sounds good to me. In fact it is so necesary! Go for it girl! YAY!! Kathy is a wise woman. Knit, enjoy, be wreckless...what's the worst that can happen? NOTHING! My heart stopped at 'our people'...I miss you all!! Reckless abandon knitting at a fiber fest - perfect! There's a high school girl I taught to knit when she was tiny who always knits that way and creates scarves that meld disparate yarns into exquisite fabrics with drape and texture and the play of color. Aim for the big picture (and have fun with it). *This* I've got to see. Reckless abandon sounds like fun. I've been entirely too dutiful with my knitting this year - I should do this, I should do that. Enough!!! I really should just buy whatever I desire at Rhinebeck and knit myself a lovely warm wrap with it. I should, I should. Harrumph. Anybody got a cure for excessive Puritanism? Feel free to bring it with you to Rhinebeck; I'll be there all weekend, face down in the Merino fleeces. love it - Kathy sounds right on the money! enjoy your wild abandon scarf! Ha! I love her advice. I went through this very same thing while packing for vacation. I spent more time thinking about what yarn to pack than I did thinking about weather-appropriate clothing. Ridiculous, considering that I was so busy having fun that I only knit a few inches of plain sock the whole time! Rhinebeck...someday I may have that "what do I knit at Rhinebeck" problem. Love your choice, your yarn, your post. Can't wait to see the weekend's pics for the festivities. It's going to look fabulous.